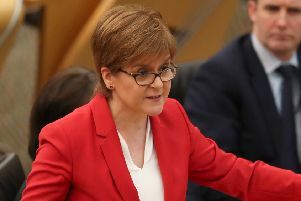 THE Scottish Government’s spending on private healthcare is at a record high – despite it pledging to drive such expenditure out of the National Health Service in Scotland. About £82 million was spent on private health firms last year, compared with £75.9 million last year and £58m in 2006-7 when the SNP came to power. Labour accused the SNP of “sickening hypocrisy” over the increase. Public services spokesman Dr Richard Simpson said: “These figures reveal the sickening hypocrisy of the SNP around our NHS. There are now also fears that spending more of taxpayers’ cash on private health services is an indication of the problems experienced by the NHS and its inability to deliver the care patients across Scotland need. Dr Simpson added: “The spending is also wasteful, as locum doctors and agency nurses as well as private procedures are inevitably charged at a higher rate than they would be in the public sector. “And despite this increase in private sector spending the SNP still can’t meet its own treatment-time guarantee which gave patients a legal right to be seen within 12 weeks. “Thousands of Scots have waited more than 12 weeks for treatment meaning the SNP government has broken its own law thousands of times. NHS Lothian spent the most on private care – £17.8m, up from £16.6m the previous year. NHS Greater Glasgow and Clyde paid the second-highest sum – £12.5m, but this fell from £13.8m the previous year. Health secretary Shona Robison said: “The Scottish Government is committed to protecting our NHS and keeping it in public hands. “There has been an increase of more than £400m in health resource spending – taking the total health budget to more than £12 billion for the first time. “Scotland’s NHS are seeing more patients than ever before and carried out a record of more than one million in-patient procedures last year – an increase of almost 18 per cent under this government. NHS spending in the independent sector represents less than 0.9 per cent of NHS Scotland’s front-line spending. The figures on spending on the private sector come from the annual accounts of Scotland’s regional health boards. Last month, it was revealed that the NHS in Scotland has nearly 450 unfilled consultant posts and 2,200 nursing ­vacancies.